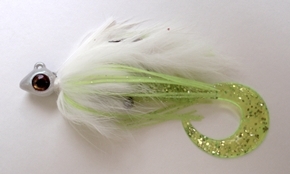 Swim Jigs are versatile fishing lures for freshwater and saltwater game fish. They're extremely effective on a number of species, including largemouth, smallmouth, and striped bass, redfish, speckled trout, flounder, and snook. 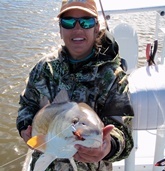 And with strong enough hooks and equipment you can target cobia, jacks, and other near shore game fish. But most of all they're just flat out fun to fish! Read on to learn about how they're made, the best ways to rig and fish these jigs, and how to target your favorite game fish. You'll also learn about the brand new swim jig from Buggs Fishing called the Hydra Bugg, and how it's unique features and effectiveness will earn it a place in your tackle box. Legend has it that Swim Jigs kind of happened by accident. 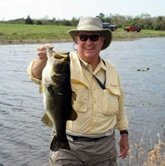 Apparently, in the mid 1970's a professional bass fisherman from Wisconsin was jig fishing and kept getting bit as he was quickly reeling in his jigs before making his next cast. So a new way of jig fishing was born, and the lures themselves evolved to fit this technique. Fast forward to today, and swim jigs are everywhere and the technique is used all over the world with fantastic results. The most popular use of the swim jig is in shallow water cover, and that has influenced their design and construction. Swim Jigs start with specially designed jig heads. They're made to swim through lighter cover and open water, so the heads are streamlined. They include light weed guards to keep grass off the hook and to keep the lure swimming. Some of the heads include eyes and some do not. After these features, jig head designs are many. When we set out to create the new Hydra Bugg Swim Jig head, we were seeking a versatile design for both freshwater and saltwater fishing. We wanted a jig head that was effective whether utilizing a steady swimming retrieve or a jigging retrieve, whether in the shallows or in deeper water. Lastly, we wanted to create a trigger point on the head. This led us to design the jig head with the biggest eye possible, as you'll notice in the pictures below. The Hydra Bugg Swim Jig head was designed in collaboration with a professional bass fisherman. The head is streamlined with a pointed nose and narrow profile for slipping through cover. 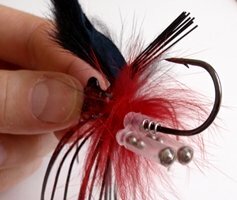 The eye of the hook is recessed in the lead head so that braid and other super lines won't get pinched. The line tie is located on top of the head. 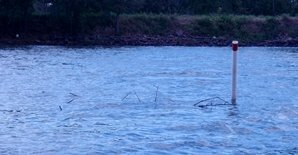 This allows for a swimming retrieve or a jigging retrieve, and also helps protect your line from rocks, shell, and other cover. The most popular weight for swim jigs is ¼ oz. That is the weight we started with, and we use a 60 degree Mustad Ultra Point Black Nickel jig hook. The hooks have to be strong enough to handle big fish, and this 4/0 hook fits the bill. You'll also notice that the lead is concentrated at the head, and there is no spike keeper. This allows us maximum versatility in the materials we use to construct the jig. All Swim Jigs use silicone or rubber skirt material behind the head to create a profile and provide action on the retrieve. These jigs imitate bait fish or crawfish, so the color range is wide, including black, brown, green, and lots of lighter colors as well. Underneath the skirt most jigs have some way of securing the trailer. Several varieties include rattles. When designing the Hydra Bugg Swim Jig, we sought a way to combine the action of silicone skirt material with the rabbit strips that have proven so effective on our other jigs. Rabbit strips move like nothing else, and the hide is absorbent and will hold scent. They're also super tough, withstanding the abuse of saltwater and freshwater game fish. We discovered a way to palmer (a fly tying term that means to wrap around) a standard rabbit strip along with a silicone skirt. This gives the standard skirt more movement, an accent color, and completely secures the skirt. Then we topped it off with a magnum rabbit strip for even more movement and a solid back like a bait fish or crawfish. 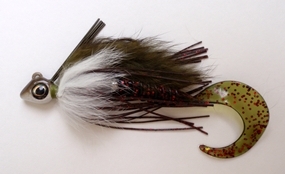 This combination of natural and synthetic materials in a jig skirt is unique and accomplishes our mission of bringing the best ideas from the fly fishing world to baitcast and spin fishermen. Swimming a jig puts the maximum stress on jig trailers, so securing them effectively is vital. That's why we use a custom screw lock we can tie to the hook shank. Rest assured your trailers are indeed locked on no matter how fast you work your jig. Between the custom screw lock and the innovative skirt we added two clear, hard plastic rattles secured with a silicone rattle band. The silicone band won't warp, crack, or wear out and was made to fit the rattles. Rigging Swim Jigs is simple but the choice of trailer has to be made. Several different trailers are available, and with a few guidelines you can pick the most effective one for the type of fishing you're doing. If you're trying to imitate bait fish, the two best trailers are grubs and paddle tail soft plastics that are sometimes called shad tails or boot tails. Most freshwater anglers use thick grubs for maximum vibration in the water, and that's the same reason to use the shad/boot tail trailers as well. These same trailers work in saltwater as well, but we've found that thinner grubs are tremendously effective. Trailers in the 4” to 6” range work best. Although smaller finesse jigs are quite effective in certain situations. 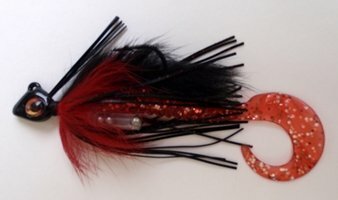 To imitate crawfish, there is an even bigger variety of trailers to pair with your jig. Crawfish trailers have claws just like the real thing, and then there are double tail grubs that will impart similar action. The action is what's important, however. You have to determine the action you'll get from your trailer on a steady retrieve. That leads us directly into working Swim Jigs. Cast towards light cover or anywhere else there might be a fish and reel it in. How's that for easy? That's one of the beautiful things about fishing these jigs. Sometimes it's really that simple. And here is where the fun comes in! One of the best ways to work these jigs is on a steady retrieve, right under the surface. That means oftentimes you'll be able to see it when the fish hits it! It just doesn't get any better than that! You can easily vary the depth by slowing down your retrieve or by letting it sink before you start reeling. When saltwater fishing I like to work the entire water column and find out where the fish are. When you're fishing swim jigs with rattles you can make more racket when you give them some jigging action. Giving them some action on the retrieve works in all kind of situations, with all types of lures, and with every species of game fish. So you might as well try it. Here's the thing. I always hesitate to give hard and fast rules for fishing because it's different every day. I like to give suggestions and then tell people to let the fish dictate what they want that day. That's my best advice on working swim jigs. Freshwater fishermen will tell you to fish swim jigs under the same conditions you would a spinnerbait, and in the same manner. They're three season baits, successfully fished in the Spring, Summer, and Fall. Anytime you find flooded grass, lighter stick-ups, pilings, along moss banks, and through lily pads, you can throw a swim jig. Here's an example of what I'm talking about. See the picture in the middle below? This is a hump on a 15 acre East Texas lake, and you can see the marker and the stick ups indicating there was some good cover underneath. I was fishing this lake last June and came upon this spot and knew it might be good for a swim jig. The bass in the pictures came from this spot on consecutive casts to each side of the stick ups. On both casts I was using a steady retrieve and brought the swim jig quickly through the stick ups. These bass were caught using early Hydra Bugg prototypes. I was fishing from a boat when I caught these bass, but another one of my favorite places to fish them is from the bank through broken up moss banks. 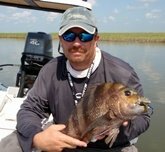 Bank fishing can be absolutely phenomenal along the small ponds or “tanks” scattered throughout Texas and the South. Many of these ponds have vegetation growing out from the banks where big bass sit and wait to ambush something swimming by. So why not feed them a swim jig? For saltwater fishermen, these jigs can be utilized in just about any situation. 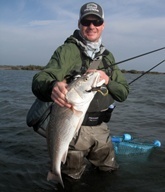 The head is made to give it jigging action when you drop your rod tip, so fishing it in 2' to 6' of water is very effective for redfish, speckled trout, and flounder. It also makes a great sight casting lure in shallow water. 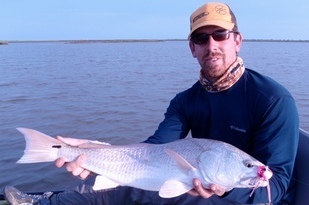 During a testing trip one of our pros fished it in less than a foot of water and caught a redfish blind casting, one from a pod of fish, and a crawler. 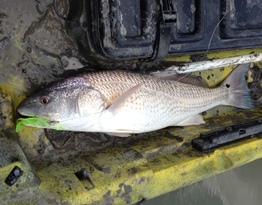 You'll see two of these fish below, caught by Buggs Contributor Sonny Mills. The light weed guard means you can throw it into flooded grass and mangroves when the fish are up tight to structure or chasing bait in the grass. And I have several customers who can't wait to target cobia and other near shore game fish along weedlines and oil rigs. Swim Jigs are effective freshwater and saltwater fishing lures for a variety of game fish under a variety of conditions. Plus they're flat out fun to fish! They draw vicious strikes near the surface that you can oftentimes see! I hope you'll give them a shot on your next fishing adventure, but be sure to hang on when you fish them! Follow the link below to check out all of the available colors of the brand new swim jig from Buggs Fishing called the Hydra Bugg! The brand new swim jig from Buggs Fishing is called the Hydra Bugg. The names comes from Greek mythology. The Hydra was a many-headed serpent, and the name also denotes water. When designing a swim jig, we wanted a lure with many qualities that would appeal to all five senses of predatory game fish. We wanted to create a striking and aggressive look, and that is why we gave it the largest eye possible and incorporated the unique combination of rabbit strips and a silicone skirt. We also made it loud, with the double rattles that engage every time you bump something or give it action. The screw lock on the hook shank securely holds your trailer, no matter how fast you work it, so you get the maximum vibration. We tie it with rabbit strips, which have absorbent hides. Soak the jigs in your favorite scent prior to use and you'll have a jig that smells like the real thing. Finally, the combination of natural and synthetic materials and even the weed guard contribute to the feel of squirming, spiny forage. Click here to check them out in the online store!